The drawing was made on one of the smaller and less perfectly equipped hospital ships which have occasionally had to be called into service during times of hard fighting. Like most night-sisters in hospitals, an R.A.M.C. 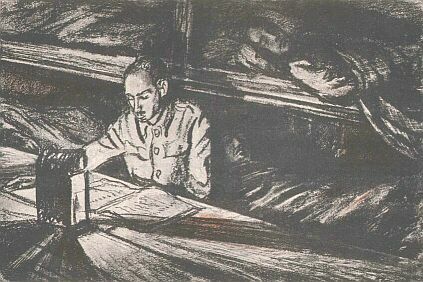 orderly on night duty usually ties himself, as it were, with an elastic string, to a piece of literature, so that he can at once be drawn away from it by the needs of any of his patients, but springs back to his reading as soon as this pull is relaxed.